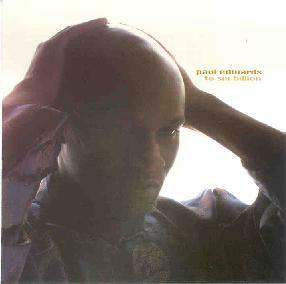 Paul Edwards - "To 6 Billion"
There is something uniquely beautiful on the new CD by Paul Edwards entitled To 6 Billion. With the perfect mesh of intricate detail, sonic balance, smart deeply felt/programmed electronics and angelic vocal work by Sierra Hurtt-Akselrod-- Paul Edwards has hit a Babe Ruthesque home run. After I listened to the new Paul Edwards CD, I dumped a DJ booking on a friend (also a DJ) and began to sample, scratch, compose beats and string sections for two days at my studio. No horseshit Jack, I got some serious inspiration from this new release. I kept shuffling back and forth between Edwards and Underworld’s masterwork, Beacoup Fish with the fevered compulsion of a fulltime heroine user. Edwards digs deep on this release and has more than a few tricks up his down tempo/experimental electronic sleeve. In particular, track 1 (Burn) sets the mood with the following lyrics: You’re cold, cold and uncaring. It’s like your reading a line off of cue cards. There’s nothing in your eyes. There’s nothing in your eyes. Heavy stuff, and really, who hasn’t felt that at one time or another? The drum programming throughout this track (and album) is remarkable and obsessively executed. The whole damn record warrants more than one listen; this should be in the 10- disc CD-changer for the next 100 years as a record of at least one thing that mankind did right. Haven’t heard of Paul Edwards? You will.